Offering a streamlined design and thick steel construction, this self-defense and survival knife is built for speed and strength. 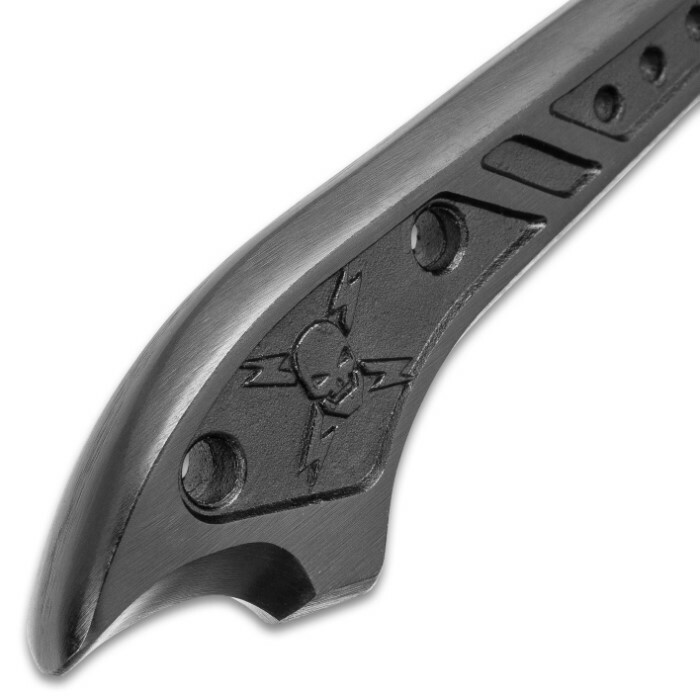 The harpoon-style cutting edge offers an aggressive forward slanted point with slightly curved edge. This piece is forged from a single piece of AUS-6 stainless steel with black oxide finish. The handle is lined with lanyard holes which make it possible to lash this knife to a staff or branch to make a survival spear for hunting or fishing use. When used for spear fishing the blade's barb helps to prevent fish from coming loose before you are able to retrieve them. A rubber sheath with belt loop is included for safe storage and transport. The knife measures 8 1/4 in. overall. I watched the video and looked at the harpoon in the mans hand to see the real size. This is exactly what i was after. "A really tuff harpoon that i could carry around easy and still be able to use like any large harpoon." I can put this on my side and take with me. then put on a stick and use it when i get where i need it. This is a great buy if you want a portable and afordable harpoon. Made very strong and all one peace. 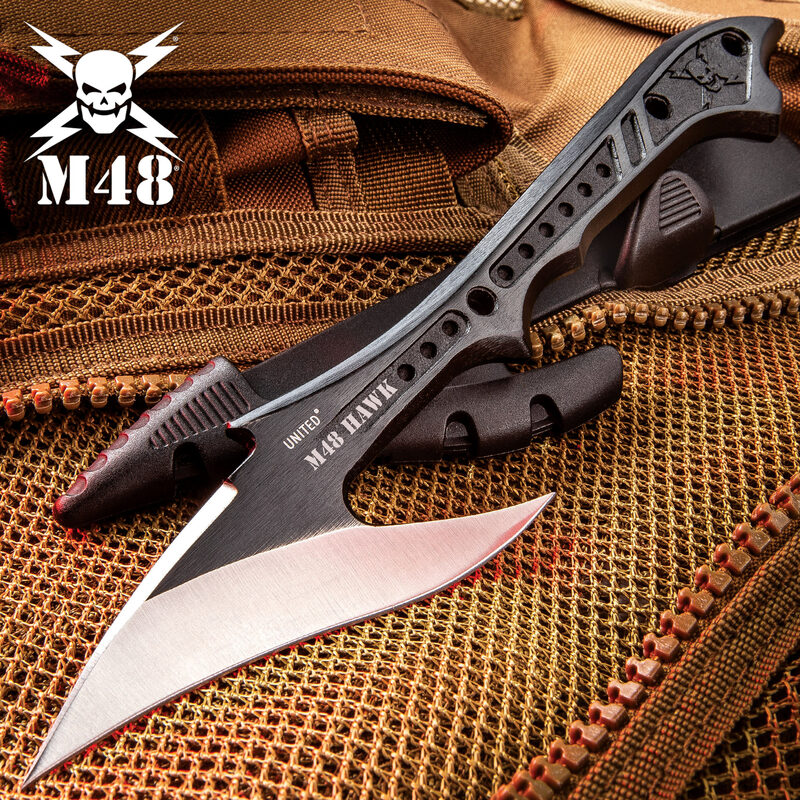 It's very small, it's true, but it's perfect for a bug out bag, or to have in the car as a tool, or any other situation where you need a sharp edge, it doesn't have to be a sword, if that's what you were looking for than there's plenty of those as well in this site, granted the pictures can be misleading sometimes, but that's why you should read the reviews...all in all it's a nice little tool, versatile and sturdy! Excellent blade! Sharp out of the box, and with a small bit of sharpening cuts paper with ease. Smaller than I expected, but it fits in the hand very well. Made of a single piece of steel, so very sturdy. Sheath fits perfectly and holds tightly. Makes a great addition to the collection. I bought this and it is awesome. You just lash it on to a nice strong stick using bailing wire. You might want to cut a groove into the end of the stick so it can be more secure, and so the bailing wire won't rust paint some kind of latex paint or varnish over it, The blade is sharp but you can make it sharper if you wanted to. There is 3 holes on the blade for lashing so this was made for that.